Serrano ham is one of Spain's most widely-eaten foods and the product that most clearly announces the country's national cuisine on the world stage. In themselves these are already good reasons to protect the market and ensure the quality of Serrano ham. But because everyone associates the name with quality, there are always those willing to misuse it, unscrupulous producers trading on the implications of a name they have no right to use to seal an inferior product. Consumers have a right to be protected from this. With these issues in mind, in 1992 the European Union created a system to monitor and certify the most important agricultural and food products from member countries. They created several labels that would identify products that had been produced and processed according to strict regulations to ensure quality and make sure that products being sold as the results of traditional processes really were what they said they were. The name of Serrano ham is one of the products that is protected by these regulations, being recognized under the Traditional Speciality Guaranteed (TSG) scheme since 1998. This certification does not protect the origin of products as a DOP designation does but it does require certain techniques of rearing, production and processing. Any Serrano ham you see has to comply with these rules. The regulations state that Spanish ham should be drawn from the hind legs of pigs only - meat from their forelegs is called "shoulder" - and should follow a set of guidelines concerning slaughter and butchering practices. Pork should have a traceable provenance and the feeding regime should be wild pasture and grain. Weights, times of breedings and a minimum pre-slaughter fattening period are also stipulated. If a ham is to be labelled Serrano ham, it must also comply with regulations on its curing environment. These regulations, decreed in 1998 by the Ministry of Agriculture, establish strict quality standards for Serrano ham. 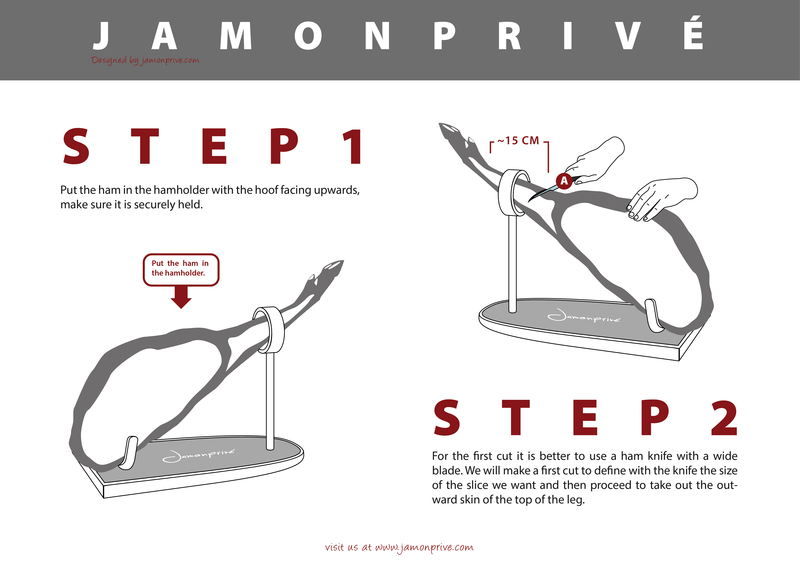 For example, a ham must weigh no less than 9.2kg, the thickness of its outer layer of fat must not exceed 0.8cm and the curing period must be no less than 210 days in a low-humidity environment. Once the drying and curing process is complete the Spanish ham is ready for consumption, but rules apply here too. 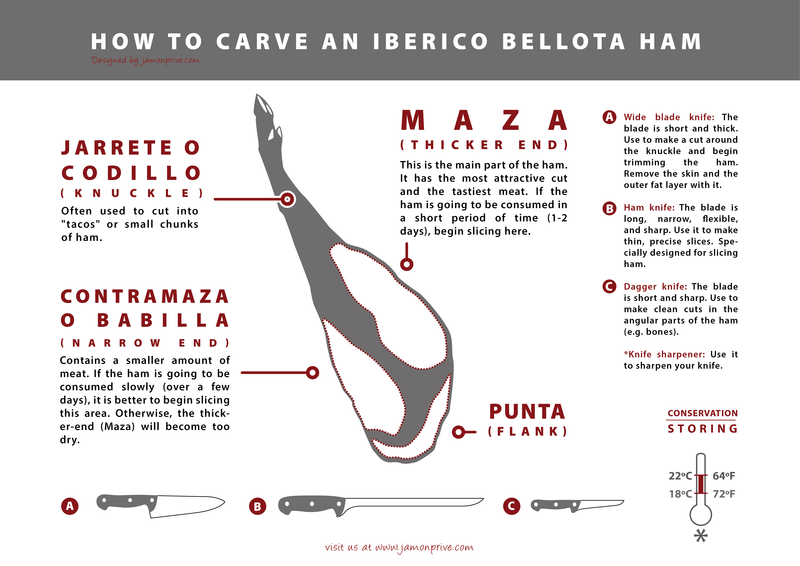 Serrano ham must present a pinky-violet appearances, neither too dark nor too light, and bright fat and a juicy texture. Quality hams don't require much salt so a delicate flavor with relatively little salt is also a mark of quality. 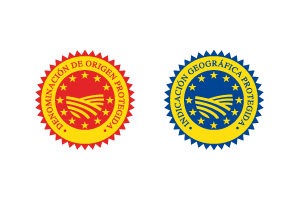 To ensure that the legislation is effective, producers must keep documentation that tracks pigs from birth through to retail, and only after being checked and audited by the authorities is the coveted TSG certification given, guaranteeing the quality of Serrano ham. However, in addition to the TSG mark there is another scheme that guarantees the quality of ham to an even higher standard. This is the Protected Denomination of Origin (DOP) scheme, which in the case of Serrano ham requires that the ham come from either the Trévelez or the Teruel regions. There is currently a campaign underway to put some Spanish hams under the Protected Geographic Origin (IGP) umbrella, particularly the famous Seron ham. Finally, an ecological label is awarded to hams produced in a way that is environmentally caring and fed a special, strictly-controlled ecological diet. All these schemes have one thing in common: they all seek to protect producers of Serrano ham from unfair competition and to make sure consumers have honest information about what they're buying. That way,when you see the name Serrano ham, you know exactly what it is!